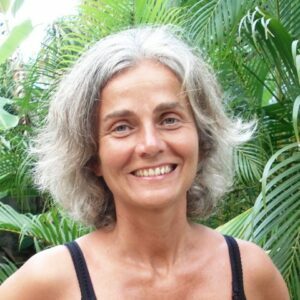 Elles Theulen started her yoga journey in 1992 when she spent several years in India studying various approaches to yoga, meditation and holistic therapies. From then on she established a daily practice routine and continued exploring yoga in Sivananda and Iyengar classes, workshops in Scaravelli and Slow Flow, retreats in Ashtanga and Yin Yoga, courses in anatomy and Eastern philosophy, and deepened her understanding of meditation in Vipassana, Zen and Tibetan Buddhist retreats. She qualified to teach Hatha Yoga (through Integral Yoga) in 2012 and Yin Yoga (through Sarah Powers) in 2015. A Kishori Yoga class starts with a gentle warm up followed by a slow flowing yet energising sequence of asanas. Then we explore several asanas in more detail. These active poses strengthen and lengthen the muscles, and bring you in tune with the alignment of the body and the breath. The class always includes some passive poses as well, allowing gravity to do the work. These so-called Yin poses strengthen the ligaments, freeing up the joints, and give you time to observe the response from the body and mind. Each week has a slightly different focus, though breath and awareness are always key elements. This class assumes some previous experience with yoga and builds towards intermediate level.